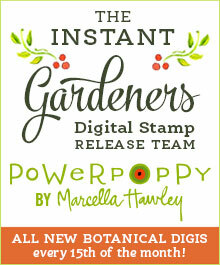 As a member of the Instant Gardener team for Power Poppy, I get to color all the new digital stamps that are released each month. But when I saw the new Feeling Fall clear stamp set, I knew that I had to have it. After all, why should the Bloom Brigade get all the fun! To be honest, I loved it for the spooky black cat (here colored as a slightly menacing tudexo cat) because she reminded me of the grumpy face (shown here) of our own cat Phebe. While Phebe is normally a pretty sweet cat, she does have a way of communicating her displeasure when we run out of her favorite treats. The background paper is from the Vintage Halloween 12×12 paper pad by Love Nicole that I found at A.C. Moore. I don’t usually add a lot of embellishments to my cards (although I recently admitted my addiction to enamel dots), but loved this spooky spider die from Memory Box and thought that it was the perfect enhancement to the paper. I cut him from Bazzill cardstock in black and added a little Glossy Accents to make his body shine. That’s all for now — thanks for stopping by! What a fun card, Nancy, and I love how you had the benefit of a black cat! Beautifully colored and such fabulous DP! Hugs! Nancy, my friend, this turned out beautifully! The depth of your coloring is fantastic, and I love that spider accent at the top!